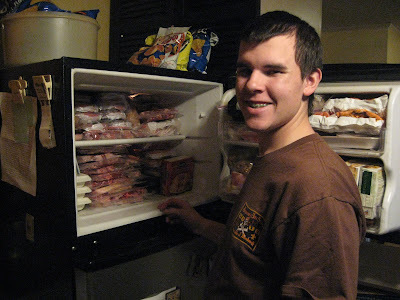 Yesterday I stocked up on meat when Omega Meats stopped by my house. That's a company based in North Carolina, and they deliver meats right to your door. The first time a meat truck stopped by, it did not have a sign on the truck. I'd read something about mad cow disease that week, so I was rather nervous on random meat. I called the local cops. This is a town of only 800, and the police station is just one block up. So, they checked it out, and it was on the level. That was, by the way, another company and not so well marked as Omega Meats. By this time, I am OK with ordering meat online like from Omaha Steaks and also with the random meat men who stop by and want to sell me meat off the street. Still seems an odd concept, but it's convenient, and the prices are good especially in a small town and at the end of the day. Ronald Williams and another nice guy were winding down on the day and had some cases of steaks and pork that would be perfect for the grill. But, I have a small refrigerator with a very small top freezor. So, I called a neighbor to see if he wanted to split the cost and the meats. It was still a tight fight as you can see in the above photo. 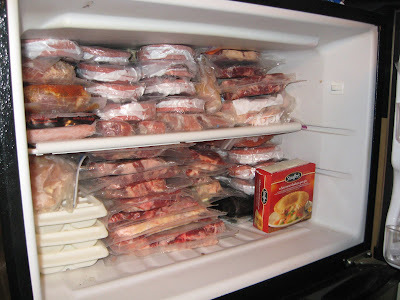 My son is the master at organizing and packing, and he had to pack out three times to get all the meat in the freezor. The company guys will do that, but it just seems too intimate to me to have someone playing in my freezor. Also, I had to send a bag of food over to my Mom's house when we flat could not get it all in. Now, this is a well stocked freezor for sure. Eli did get all the meat in, and it was just some random stuff like chili beans and hash browns that had to go over to Mom's where she has a full sized freezor. The meat from Omega Meats Inc is very good. It's sealed tight unlike some of the loose packs at the grocery store. And, they do guarantee the meat for a full year - even if the power goes out and the meat goes bad. Hard to beat that. If you're in North Carolina, they cover most of the state. Heck, Omega Meats even covers out here in the middle of nowhere. They can set up a regular delivery, or you may just get lucky when they drop by and have some boxes left and want to move them out before heading back to the office. They have chicken and seafood, but we got the last boxes left which were beef and pork which I especially liks for grilling. If you want to follow up with delivery meat that's great on the grill and keeps a long time, then the phone number for Omega Meats is 336-662-0000. I've never called myself or had any regular delivery, but I might buy if they catch me right in from work like yesterday. It really depends on my space, and it was tight this time. I was feeling pumped with the freezor packed with meat ready for grilling, but then I got ready to go to bed and discovered that I'd been robbed. Sigh. 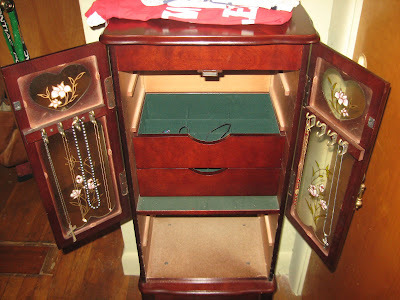 Someone broke in and took a lot of my jewelry as you can see here. They didn't just take the stuff, they took the drawers, so I now need to see about getting a cabinet maker to custom make some new drawers to boot. Oh well, some things go well and some not. I'm still pumped about the good deal on the meat for grilling but hate that I had a robbery at my house while I was at work. Better than when at home though, so I count myself lucky on that. Sorry to hear about the jewelry, but wow on the meat!! Hi Nora - Thanks for stopping by. I'm glad we enjoyed out meal before I discovered the theft. We are locked down tight now, so maybe we won't have any more burglars. That's a bad feeling knowing someone was in the house. Just glad we were not here at the time. Did you consider the meat folks stole from you? Have used them before and quite shady sales/delivery folks employed by them. Yes. I did consider the quality and price. For the amount of meat, it was a decent deal. Was it top quality grilling meat? No. Kind of thin and fatty for the grill. Would I buy again? Hum. Not sure. I prefer the store meat, so unless the price was really great, I'd go with the local store. Tks for posting. It is good to have a follow up.